Constitutional law is the study of foundational or basic laws of nation states and other political organizations. It provides a framework for creating laws, protecting an individual's human rights, and electing political representatives. Constitutions are the framework for government and may limit or define the authority and procedure of political bodies to execute new laws and regulations. Constitutional law looks at the sources in which the triers of fact would turn to guide their constitutional interpretations, and how such judges may weigh the words of the text of the document, the framers' intentions, case precedents, and policy consequences of the interpretation for a legal decision. These foundational or basic laws of states or organizations, guided by constitutional frameworks, are the bases for a cooperative give and take leading to peace and prosperity for all while at the same time ensuring the human rights of all members of that society. Constitutional law is created through judicial interpretation of the constitution. Judicial review of the constitution by judges who study and construe the constitutional sections encompasses court decisions which create the body of constitutional law. This case law becomes the precedent for future cases. In the United States, there are cases arising under the constitution, federal law, or a treaty. For example, when the United States is a party, there is usually sovereign immunity whereas the United States cannot be sued without its consent. Yet, there is no immunity where the action is beyond the scope of statutory power or the action is constitutionally void. When the suits are between a state and citizens of another state, the Eleventh amendment bars citizens from suing the state in federal court without its consent. Yet there are limitations on the eleventh amendment where it does not extend to appellate review of the state suit against the citizen, to suits against state subdivisions, against state officials acting unconstitutionally so long as damages for past conduct are not paid from state funds, or to money damages from state funds. In American constitutional law, there is a separation of powers called checks and balances. There is judicial power through Article III which encompasses the Supreme Court and lower federal courts. Under the jurisdiction of the Supreme Court, the court which is a key factor in developing constitutional law, there is original trial jurisdiction in cases when the state is a party, ambassadors, and such. The Supreme Court determines if certain state and federal laws and executive actions are consistent with constitutional power. There is appellate jurisdiction subject to Congress' power to regulate and exclude. Additionally, there are limitations to jurisdiction of the federal courts wherein only definite and concrete legal interests are decided along with a standing requirement. The courts will not decide political issues. There is no constitutional provision giving the Supreme Court the power to review federal or state acts and declare them unconstitutional. Yet, the case of Marbury v Madison gave the Supreme Court the power to review the constitutionality of congressional statues and Martin v. Hunter's Lessee created the power to declare state actions unconstitutional. The principles of American constitutionalism lie in the limitations on the exercise of governmental power, that of due process and equal protection. There are individual constitutional rights embedded in the Bill of Rights, in procedural due process with a right to a hearing, substantive due process and equal protection, restrictions on the taking of property without due process, and retroactive legislation encompassing the contract clause, due process and ex post facto which is the barring of the retroactive application of unforeseeable interpretations of criminal statutes. 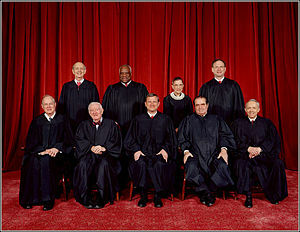 There is a limitation on the exercise of governmental power in the First amendment, freedom of speech, press, religion and association as well as the congressional power to enforce constitutional rights as in the Thirteenth and Fifteenth amendments regarding racial discrimination, the Fourteenth amendment to remedy state discrimination, and an additional power to protect civil rights against state and private interference. The United States Constitution is the supreme law of the United States of America. It was adopted in its original form on September 17, 1787, by the Constitutional Convention in Philadelphia, Pennsylvania, and later ratified by conventions in each state in the name of "the People." The Constitution has a central place in American law and political culture. The U.S. Constitution is argued by many to be the oldest written national constitution, except possibly for San Marino's Statutes of 1600, whose status as a true constitution is disputed by scholars. The handwritten, or "engrossed," original document is on display at the National Archives in Washington, D.C. The Treaty establishing a Constitution for Europe (TCE), commonly referred to as the European Constitution, was an unimplemented international treaty intended to create a constitution for the European Union. It was signed in 2004 by representatives of the member states of the Union but was subject to ratification by all member states, two of which subsequently rejected it in referendums. Its main aims were to replace the overlapping set of existing treaties that compose the Union's current informal Constitution, to codify human rights throughout the EU, and to streamline decision-making in what the 27-member organization. 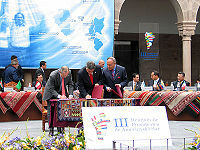 South American leaders sign the Cuzco Declaration. The Cusco Declaration, formally titled, Preamble to the Foundation Act of the South American Union, is a two-page declaration of intent signed by 16 South American countries during the Third South American Summit, on December 8, 2004, in Cusco, Peru, announcing the foundation of the South American Community of Nations. It called for a regional parliament, a common market, and a common currency. Constitutional law involves some of the most fundamental issues concerning government and society. It begins with the historical pathway from the drafting of the document through its adoption, the application of the document to governmental and societal issues, and the influences of any amendments to address issues which were not in the original document. Constitutional law looks at the sources in which the triers of fact would turn to guide their constitutional interpretations, and how such judges may weigh the words of the text of the document, the framers' intentions, case precedents, and policy consequences of the interpretation for a legal decision. The benefits that befall a society from constitutional law are that it limits governmental power to protect individual liberties, it clarifies the roles to reduce disputes between governmental parties, and it is committed to the principles of democracy and the dignity of the individual. The term "basic law" is used in some places as an alternative to "constitutional law." A Basic Law is either a codified constitution, or in countries with uncodified constitutions, a law given to have constitution powers and effect. The name is usually used to imply an interim or transitory nature, or avoid attempting a claim to being "the highest law," often for religious reasons. In West Germany, the term "basic law" (Grundgesetz) was used, to indicate that the basic law was provisional until the ultimate reunification of Germany, whereupon a new constitution would be adopted. In the event, no constitution was ever adopted, and the basic law was instead extended throughout the entire German territory. ↑ Marbury v. Madison Retrieved February 22, 2008. ↑ Martin v. Hunter's Lessee Retrieved February 22, 2008. ↑ Constitution for the United States of America Retrieved February 22, 2008. ↑ United States Constitution Primary Documents in American History The Library of Congress. Retrieved February 22, 2008. Casey, Gregory. 1974. "The Supreme Court and Myth: An Empirical Investigation." Law & Society Review, Vol. 8, No. 3, 385–420. Marbury v. Madison decision from LII-Cornell Law School. This page was last modified on 21 March 2017, at 18:59.